I have been blog MIA lately, I know, but I was busy celebrating my birthday and being lazy :-P. I really milked it this year. My husband even threw me a party! Whoop whoop!! But now its time to get back to reality. And there’s nothing that brings me back to reality like a frustrating week of DIY. My awesome in-laws got me a new spray gun for my birthday and I immediately started thinking of where to use it first. The back patio is in need of the most improvement so I decided to start there. It’s not completely horrible, and we’ve already done some work like new siding and new ceiling, but it just hasn’t reached it’s full potential yet. 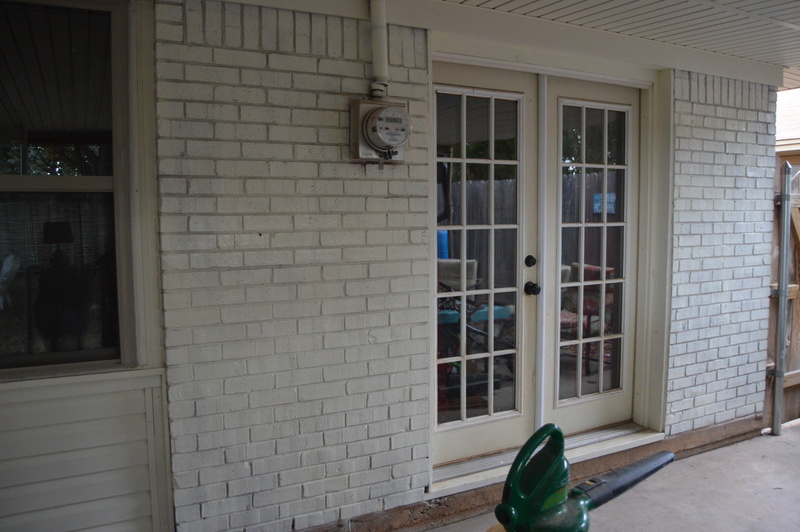 Between the brick, new siding and old siding, there are 3 different colors and just a whole lot going on. A while back I painted striped to create and accent wall and it just made everything even more busy. I spent an entire day scrubbing all the walls clean. 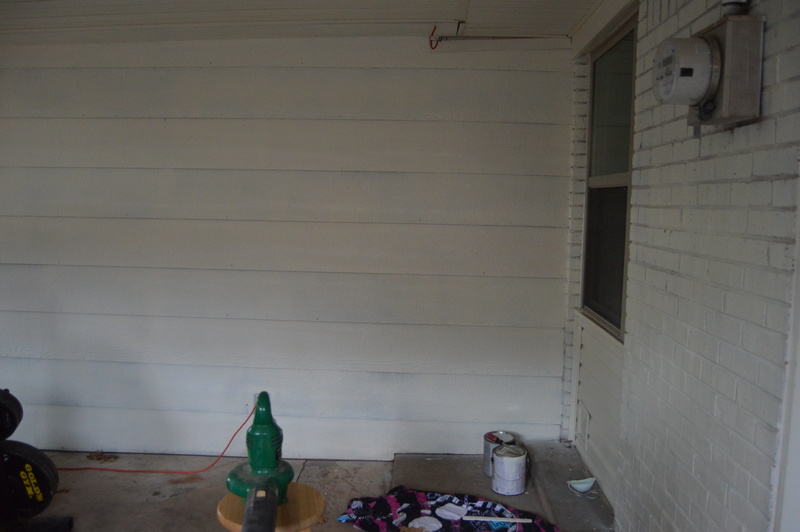 I even cleaned our entire addition because I plan on painting that too. 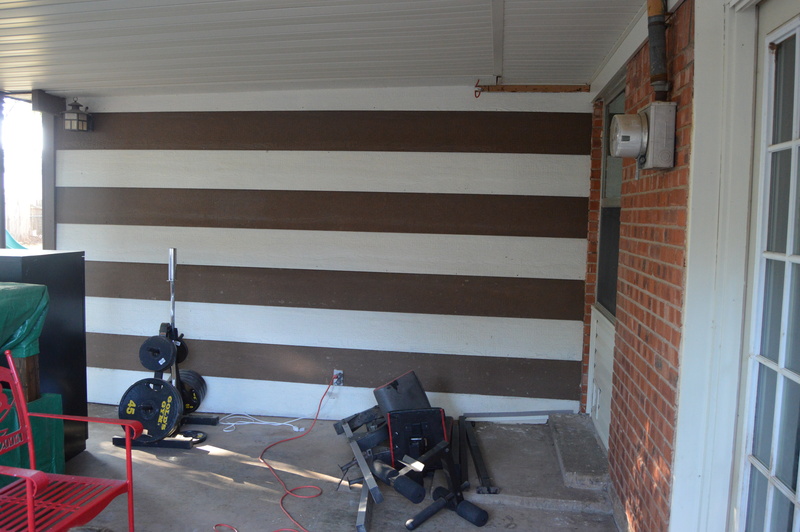 (the addition starts with the striped wall) I sprayed everything down with a vinegar and water solution: 1/3 to 2/3. I let that sit for a few minutes then I scrubbed it down with a floor scrubbing brush. After I scrubbed a 3 foot section, I rinsed it real good. You can forgo all the hard labor by renting a pressure washer, but as usual I’m on a tight budget. Once I got everything scrubbed I let it dry for the rest of the day. The next day I got my new spray gun out, read the instructions ahem…. ok I skimmed the instructions and got to work. Time for mistake #1. When I was pouring my paint into the gun container I could see chunks. The paint is at least a year old. I have a fresh can but I hate to waste anything so I pressed on. BAD IDEA! I got the first coat on but the gun kept getting clogged because of my chunky paint. I had to stop after the first coat and clean the gun. By the time I finished cleaning it, it was naptime for my little one and then I had to get my older girls from school. I was going to stop for the day but I got a second wind and decided to try again with the new paint. I put my cleaned gun back together (or so I thought),and got to work. I turned the spray gun on and…. nothing. Nothing came out. UGH!!!!!! I kept trying, adjusting the nozzle here and there, then I took the nozzle off and paint came pouring out. it was a huge, disastrous mess. WHY??!! Thank God my husband came home just in time to help me. Poor guy After I finally got everything cleaned up outside, I needed to clean the spray gun again. Guess what I found in the sink. The all important retaining ring that I forgot to put back in the gun. Of course. Well if anything it was a learning experience hahaha. 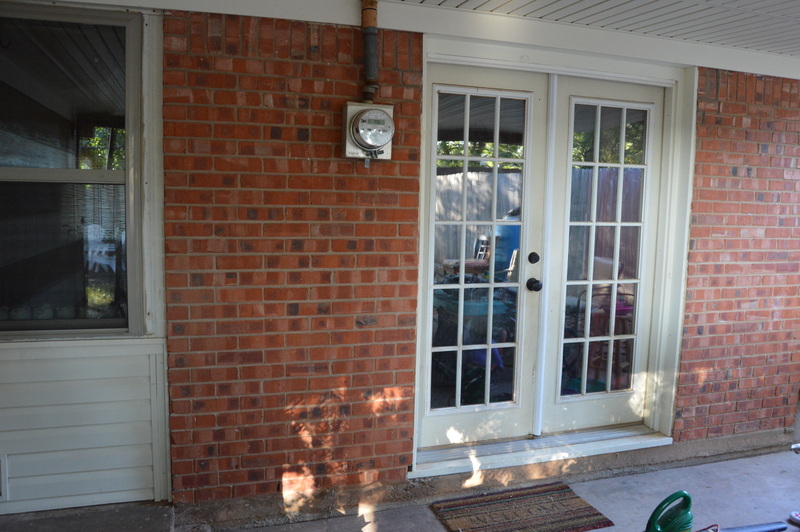 So I only managed to get one coat on the patio and didn’t even touch the addition. We are supposed to have lots of rain today and tomorrow so there will be no progress on this project. Guess I should tackle the pile of laundry I’ve been neglecting. Stay tuned for more on this project. I have some big plans so hopefully Ill have better luck once the rain stops.